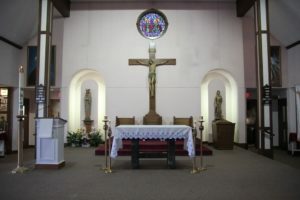 Literally, the word Sanctuary means “holy place.” Within the church it is the area where the celebration of the Mass takes place. The appointments within the sanctuary each hold a distinct function. 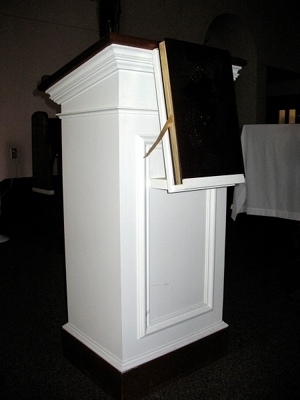 God’s word is accorded a special eminence and the Ambo is the lectern from which the Scriptures are proclaimed and then explained through the homily. 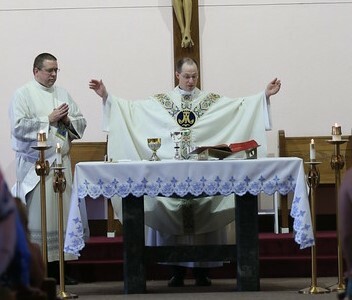 As Catholics we believe that when the priest proclaims the Word, it is Jesus who is speaking to us. The Altar is the table of worship. It is a symbol of Christ who is our Altar, Priest, and Victim. The Altar becomes the focus of our celebration of the Mass during the Eucharistic rite; that is when our gifts of bread and wine are brought to the Altar and transformed into Christ’s body and blood. Candles are always used at Mass. Originally, the altar candles were torches carried in procession before the Pope as he entered the basilicas of Rome and then placed near the altar. From the fourth century, they assumed a permanent place close to the altar of sacrifice. 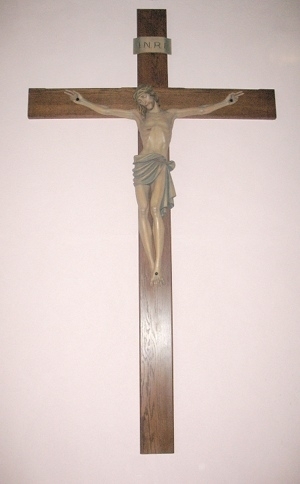 A Crucifix is a sacramental depicting the suffering and death of Christ and the promise of eternal salvation that His sacrifice brings. 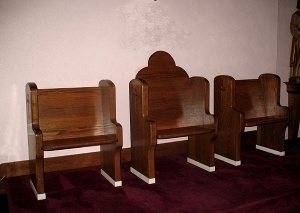 Located in the sanctuary, this is the seat from which the priest or bishop may preside over the Holy Eucharist. Its use is said to date back to the earliest of times when private homes were used for the Lord’s Supper and the chair of the head of the household was used as the honored seat for the celebrant. The Sacrament of Baptism is held in high honor in the Catholic Church. Through Baptism a person shares in the life of the Church and becomes an heir to the Kingdom of God. This large candle is a special symbol of the presence of the Risen Christ. The candle is blessed in the Easter Vigil Liturgy. The priest carries this candle into the darkened church to symbolize the presence of Christ as the Light of the World. During the Easter Season, the candle is kept in the Sanctuary near the altar and lit for all Masses. 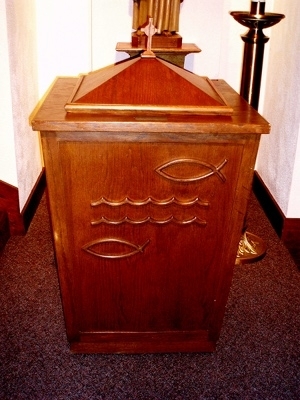 During the rest of the year, it is kept next to the Baptistry since it is used during Baptism. The Paschal Candle is also used at funerals, a sign that the Christian has come to Passover with Christ, from death to life.